BSC director calls for a coordinated effort to achieve a European Exascale supercomputer during a plenary session entitled “HPC and the Future of Computing” at the ICT 2018 conference. 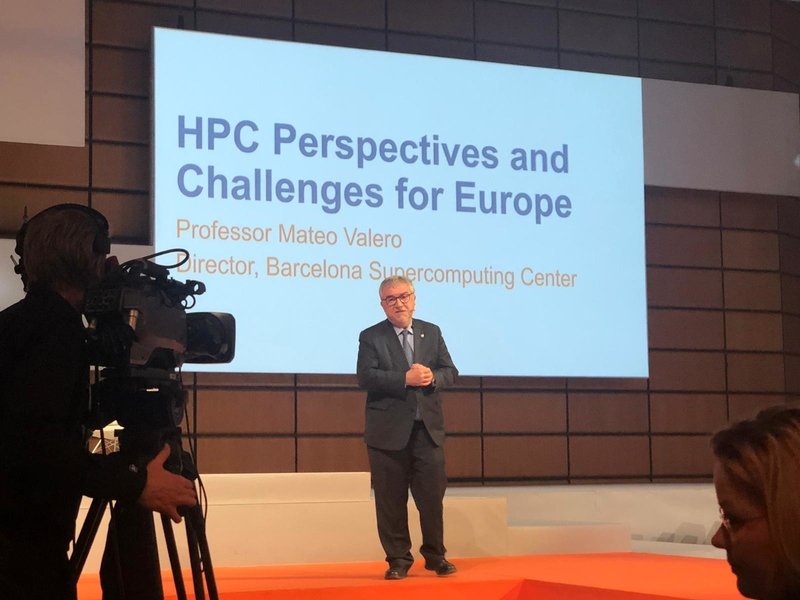 Today, Professor Mateo Valero, BSC director, called for a sustained and coordinated effort to achieve a European Exascale supercomputer, putting particular emphasis on developing European processors and accelerators. 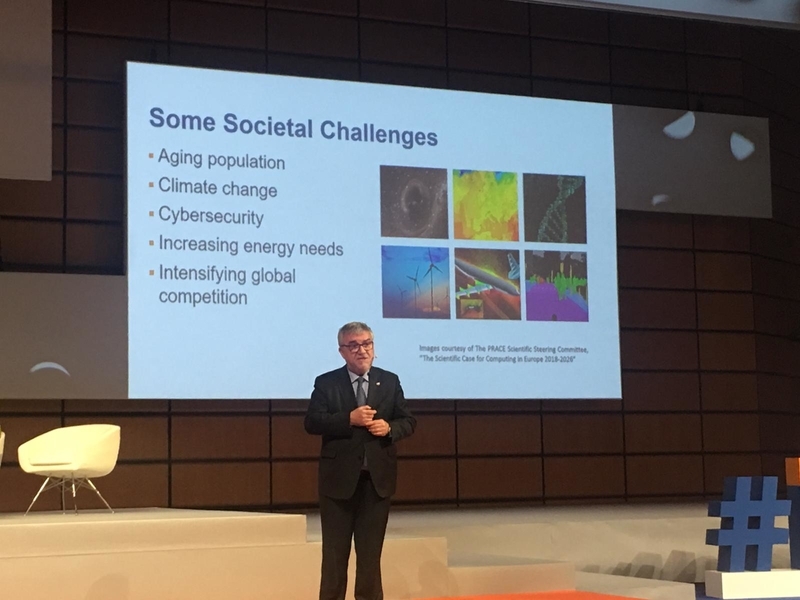 He made these remarks during a plenary session entitled “HPC and the Future of Computing” at the ICT 2018 conference taking place from 4 -6 December in Vienna. The session addressed Europe’s position regarding HPC, a technology which is essential to solve challenges for science, industry and society in general. Joining Professor Valero in this session was European Commissioner Mariya Gabriel, who is responsible for the digital single market and for ICT research and innovation. Both then joined in a panel discussion where various experts emphasized the importance of consolidating the European supercomputing ecosystem and developing domestic European technology in the race towards Exascale supercomputers. Commissioner Gabriel presented the newly launched EuroHPC Joint Undertaking (JU), that will help deploy a world-class supercomputing infrastructure in Europe and a competitive innovation ecosystem in supercomputing technologies, applications and skills. “Europe is going in the right direction with EuroHPC and this must be sustained in the long-term. 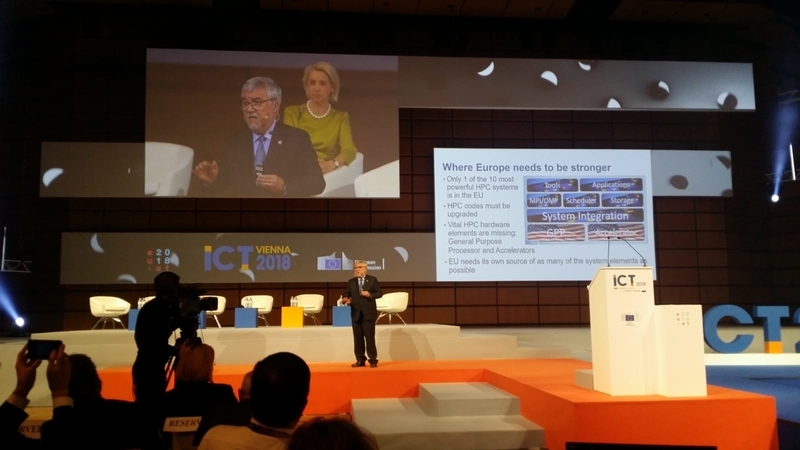 BSC fully supports this initiative and will do everything we can to help make it a success,” said Professor Valero, noting that much had been done since his previous keynote at ICT 2015 in Lisbon, where he already stressed the importance of developing European HPC technology. In this direction, he also stressed that the HPC chip design effort must continue for the EU’s security and competitiveness. It should include open-source solutions such as the ones based on RISC-V from the European processor initiative (EPI), whose aim is to co-design, develop and bring on the market a European low-power microprocessor. The European ICT research and innovation event organised by the European Commission called ICT 2018 takes place in Vienna on 4-6 December 2018. This research and innovation event focuses on the European Union’s priorities in the digital transformation of society and industry, and is an opportunity for the people involved in this transformation to share their experience and vision of Europe in the digital age.